Rugged Offroad's new Ram 1500 4WD 4" lift kit is a great suspension choice for Ram owners who want to install up to a 35 inch tall tire under a nice lifted stance. The 25-10405 Lift Kit includes new tubular upper control arms designed for 4 inches of front suspension lift. Lift is accomplished with CNC machined billet aluminum strut top spacers and a lower spring pre load spacer. For the rear, this kit includes special designed rear spring coil spacers that provide 2" of rear lift. 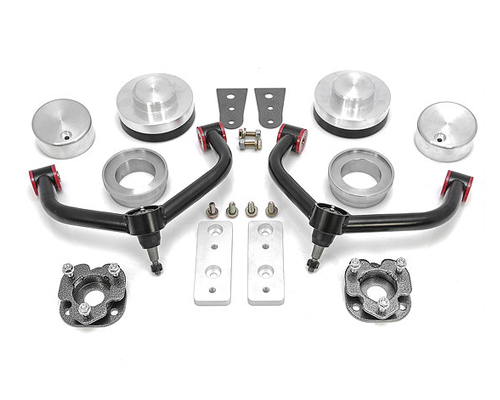 Rear bump stop extensions and front sway bar drop brackets are also included with the 25-10405 Lift Kit. Not for use on air suspension equipped trucks. Rear coil spring model trucks only.